4-Word Review: Taking back the Alamo. 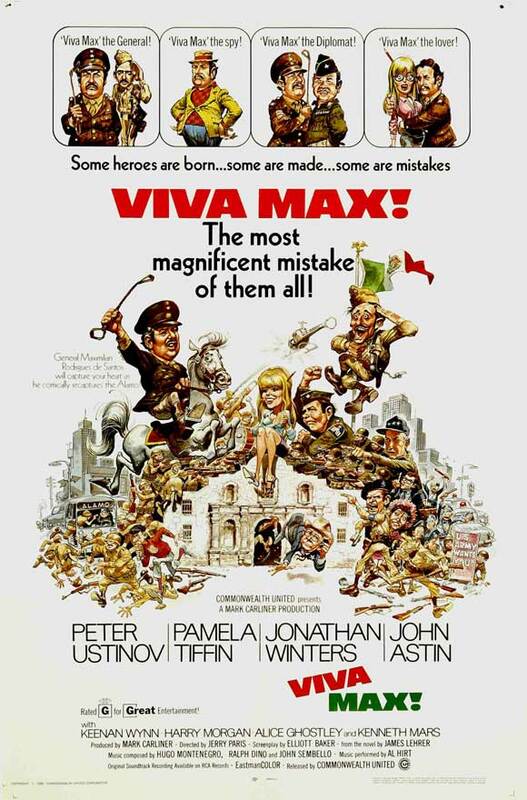 A small ragtag Mexican army led by the affable, but incompetent General De Santo (Peter Ustinov) decides to cross the border and recapture the Alamo. The process goes much easier than expected despite the fact that the army used no bullets in their guns. The National Guard is then sent in to weed them out, but they too decide not to load their guns with bullets leading to some unusual results. The film is based on the novel written by PBS newsman Jim Lehrer and the movie’s behind-the-scenes politics ends up being much more interesting than the plot itself. Filmed in April of 1969 the production initially had permission from the state to film right on the actual site of the Alamo and a major portion was done there before various citizen groups became aware of it and began protesting the crew’s presence in what they considered to be sacred ground. Some of their protests was captured on film and incorporated into the story, but their loud presence eventually disrupted the production forcing some scenes to be done on an indoor studio soundstage while still others were completed in Italy. The commotion and ‘controversy’ was not worth the effort as the film is an overall bore. The first 15-minutes are amusing and even mildly engaging, but once it gets inside to the actual Alamo the action and pace come to a screeching halt and kill any possible potential that the film may have had. The script also has some illogical loopholes one of them being the army deciding to invade a place, but without using any ammunition, which is never explained and highly improbably. What is even more ridiculous is that the National Guard would decide not to use bullets in their guns either since this is the U.S. of A. where guns and force are considered a national birthright and thus makes this ill-conceived plot twist to be unbelievable to the extreme. The fact that De Santos and his men and able to freely leave at the end and go back to their country without dealing with any type of consequence for their actions is equally absurd. Ustinov is funny and speaks in an authentic Mexican accent, but he’s unfortunately limited by the broad caricature of his role. John Astin comes off best as the Sergeant that’s second in command and does most of the actual disciplining and leading and Jonathan Winters is good as a clueless American general. Alice Ghostley lends some energy as an innocent bystander that becomes one of the army’s prisoners and Pamela Tiffin looks great wearing glasses and having her hair tinged in blonde. Gino Conforti, Paul Sand, Jack Colvin, Anne Morgan Guilbert and Kenneth Mars can also be spotted in small roles, but even with their competent performances it fails to mask the film’s otherwise glaring inadequacies. This entry was posted in 60's Movies, Comedy, Movies Based on Novels, Movies for the Whole Family, Movies that take place in Texas, Obscure Movies and tagged Alice Ghostley, Entertainment, Jim Lehrer, John Astin, Jonathan Winters, Movies, Pamela Tiffin, Peter Ustinov, Review. Bookmark the permalink.